Alèmayehu Eshété was from Ethiopia. If one were to pick a specific point that marked the birth of the distinctive Ethiopian soul music, one could do worse than choose the late Emperor Haile Sellassie’s visit to Jerusalem in 1923. During his stay he heard European brass instruments, which made such an impression on him that he hired a group of Armenian players to become official musicians of the empire. One of these players, Kevork Nalbandian, even composed the current Ethiopian National Anthem in 1926 (Although, according to Wikipedia, it was Solomon Lulu Mitiku). Thus a distinctly European flavour of brass band music was brought into a country whose traditional music bore heavy influence from Muslim forms, and its own modal pentatonic scale. Additionally, because it was actually impossible to buy saxophones, drums or other musical instruments under the Selassie regime, only the marching bands had access to them, giving the subsequently played music a foreboding, militaristic ambience. Meanwhile in Europe, a new generation became that baby boomers started the cultural revolution of rock ’n’ roll, R ’n’ B and pop music in the 1960s. The same generation in Ethiopia, in their 20s during the early 60s, wanted to change the country and get connected with the world. But where Ethiopia was different was that they had about 6,000 Peace Corps from America. President Kennedy invented this civil service for youngsters in order to work in third world countries, so these people brought with them a lot of American flavours: long hair, bell-bottom trousers and plenty of vinyl records. Thanks to the newly acquired influences from the West, the sound emanating from the clubs Addis Ababa was a heady stew of deep, hypnotic rhythms, distinctly Western guitar licks and soulful eastern melodies and vocals. The sound bore the unmistakable badge of American records (Stax and Motown artists in particular) plus something distinctly African and new. Soon labels such as Amha Records and Kaifa Records sprung up around the city to capture the sounds produced by the more popular singers and performers. Mahmoud Ahmed, Mulatu Astatke, Tlahoun Gèssèssè, as well as others all brought their soulful sound to the clubs and cut records. The Alem-Girma band was formed by Alèmayehu Eshété and Girma Beyene in 1972. Both supposedly shared the taste of music and clothing fashion that was coming from the United States (James Brown, Elvis Presley, and Wilson Pickett to name a few). The band retained some of the members from the All Star Band. From left to right: Tekle “Huket” Adhanom (guitar), Tamerat “Lotti” Kebede (drums), Alemayehu Eshete (vocals), Girma Beyene (piano and arranger) & Tekle Gebremariam (sax). The band lasted until 1974, after Colonel Mengistu Haile Mariam’s military coup against Selassie. Under Mariam’s Derg, or ruling council, Addis Ababa’s nightlife died off. 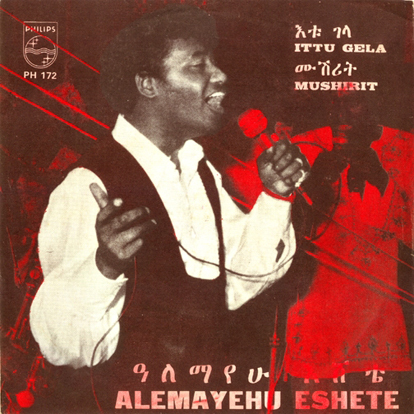 Volume 9 of the Ethiopiques series is devoted to Alèmayehu Eshété’s earlier music, while Volume 22 of that series covers his career between 1972 and 1974. Some of his songs have also appeared on volumes 3, 8, 10, and 13. Also, L’Arôme, in association with Buda Musique, has recently released a vinyl only collection of some of his best tracks, entitled Ethiopian Urban Modern Music Vol 2. He still active in Ethiopia performing and recording to this day. Catalog Number PH 172 on Philips, “manufactured by E. A. Records for Phonogram in E. Africa”. Publishing date listed as 1973.